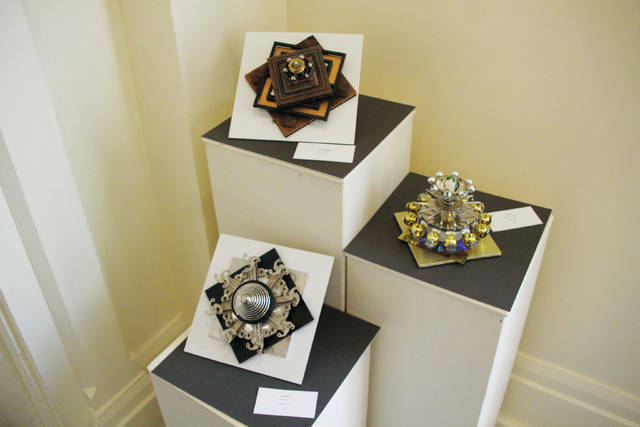 These pieces created by Timothy Bachman are part of the exhibit called Math Made Visual that is currently on display at The Arts Castle in Delaware. Works from artists Art Beery and Yasue Sakaoka are also part of the exhibit. Math Made Visual will remain in place until Jan. 12, 2018. The Arts Castle’s New Year’s Eve party will feature central Ohio band Nightfall as well as tarot card readings and caricature drawings. Beer, wine, and appetizers will be served. Activities will begin at 9 p.m. on Sunday, Dec. 31. Admission is $60 per person. Tickets can be purchased at artscastle.org. The Arts Castle is located at 90 W. Winter St., Delaware. For information, go to the website or call 740-369-2787.